South East governors, leaders and other stakeholders have opposed Biafra agitation and reiterated their commitment to a united Nigeria. The leaders also backed the call for full restructuring of the country on the platform of fairness and equity. Chairman of the South East Governors’ Forum, Dave Umahi, announced in the early hours of Sunday in Enugu while addressing newsmen on the outcome of an interactive forum of stakeholders. The meeting which held at the Nike Lake Resort had all governors of the zone in attendance. Umahi, governor of Ebonyi, said that leaders from the zone condemn all manner of hate speeches from any segment of the country. He said that they were in consultation with leaders from other parts of the country with a view to engaging the Federal Government in a meaningful dialogue. 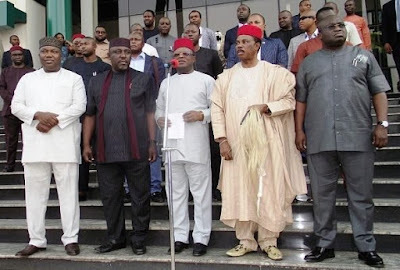 Umahi declared that the region was in full support of the 2014 National Conference report and urged the Federal Government to set up structures for implementing same within a reasonable time. “We are also in full support of the clamour for the restructure of the country and call on the Federal Government to start a dialogue with Nigerians on the modalities for achieving it,” he said. The governor said that the governors’ forum and South East National Assembly caucus would constitute the official organ that would speak for the people of the area. Umahi appealed to the Federal Government to take steps that would ensure safety of the people of the area wherever they lived in the country “just as we have guaranteed the safety of those in our domain”. Enugu State Governor, Ifeanyi Ugwuanyi in an address of welcome charged the people of the area to forge a common front. The governor said that nothing would please residents of the state than to remember that Enugu was the venue where the people of the zone gathered to resolve their differences. In attendance were former Senate Presidents, Ken Nnamani and Adolph Wabara; and the Deputy Senate President, Chief Ike Ekweremadu. Other were Senator Enyinnaya Abaribe, Senator Gil Nnaji, Senator Chukwuka Utazi, several members of the House of Representatives, members of the clergy, traditional rulers and the leadership of Ohaneze Ndigbo.